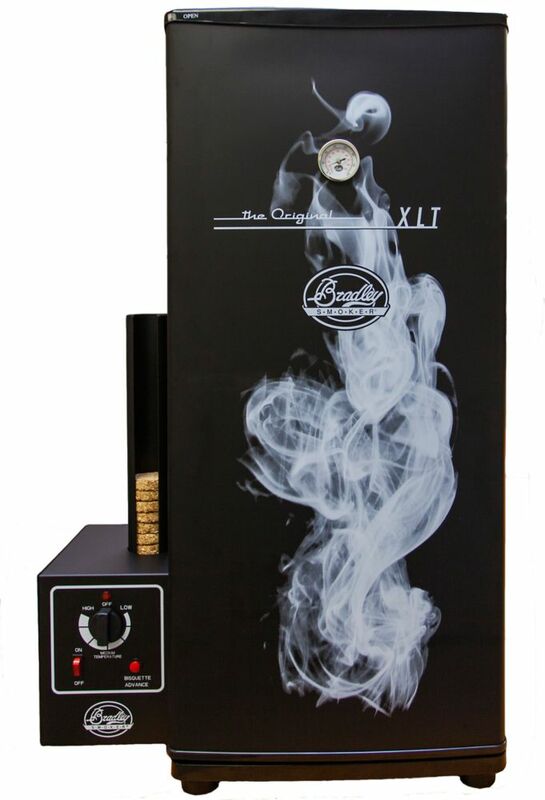 The world has seen and loved the Original Bradley Smoker for years and now you can love it even further in the 6-rack (108L) version! With the same innovative smoking technology as our 4-Rack Bradley Original Smoker, we make smoking fun and viable for anyone! With our automatic generator, the 6-Rack Bradley Original Smoker advances a new bisquette onto the burner every 20 minutes to make sure to keep a consistent, clean smoke every time. The Wide Body Propane Smoker from Dyna-Glo is the perfect solution for year-round backyard cooking. The dual cast iron burners provide 20,000 total BTUs for reliable cooking performance in any weather, while the pre-installed door seals help retain heat and minimize smoke loss for improved cooking efficiency. Six height-adjustable cooking grates provide 1904 sq. inch of cooking space and each grate can be adjusted to accommodate a variety of food types and sizes. Pre-installed sausage hooks and a removable rib rack allow you to expand your outdoor cooking options. The push-button electronic ignition emits a rapid pulse for quick and easy lighting. The temperature gauge features a "smoke zone" that indicates the ideal temperatures for infusing that classic smoke flavour into every bite. Designed for convenience, the large-capacity water bowl and wood chip box are made with heavy-gauge, porcelain-enamelled steel for hours of maintenance-free cooking. Original 6-Rack Smoker The world has seen and loved the Original Bradley Smoker for years and now you can love it even further in the 6-rack (108L) version! With the same innovative smoking technology as our 4-Rack Bradley Original Smoker, we make smoking fun and viable for anyone! With our automatic generator, the 6-Rack Bradley Original Smoker advances a new bisquette onto the burner every 20 minutes to make sure to keep a consistent, clean smoke every time. Original 6-Rack Smoker is rated 5.0 out of 5 by 1.